Homeopathy is the death of the patient suffering from gangrene. The article explains about Gangrene and its associated amputations which is a clinically challenging condition, but Homeopathy offers therapy options. The case presented herein, details about how the Homeopathic treatment helped in the prevention of amputation of a body part. Homeopathy stimulates the body’s ability to heal through its immune mechanisms; consequently, it achieves wound healing and establishes circulation to the gangrenous part. Instead of focusing on the local phenomena of gangrene pathology, treatment focuses on the general indications of the immune system, stressing the important role of the immune system as a whole. 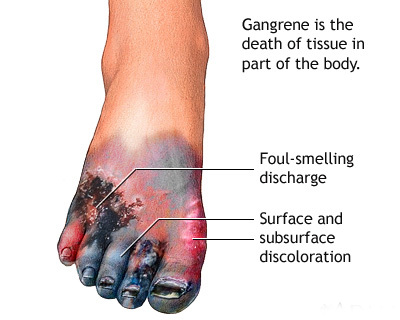 The aim was to show, through case reports, that Homeopathic therapy can treat gangrene thus preventing amputation of the gangrenous part, and hence has a strong substitution for consideration in treating gangrene. Arsenicum album– Medicine for senile gangrene;gangrene accompanied by foetid diarrhoea; ulcers extremely painful with elevated edges, better by warmth and aggravation from cold; great weakness and emaciation. Bromium – Hospital gangrene; cancerous ulcers on face; stony hard swelling of glands of lower jaw and throat. Carbo vegetabilis – Senile and humid gangrene in the persons who are cachectic in appearance; great exhaustion of vital powers; marked prostration; foul smell of secretions; indolent ulcers, burning pain; tendency to gangrene of the margins; varicose ulcers. Bothrops– Gangrene; swollen, livid, cold with hemorrhagic infiltration; malignant erysipelas. Echinacea– Enlarged lymphatics; old tibial ulcers; gangrene; recurrent boils; carbuncles. Lachesis– Gangrenous ulcers; gangrene after injury; bluish or black looking blisters; vesicles appearing here and there, violent itching and burning; swelling and inflammation of the parts; itching pain and painful spots appearing after rubbing. Crotalus Horridus– Gangrene, skin separated from muscles by a foetid fluid; traumatic gangrene; old scars open again. Secale cornatum– Pustules on the arms and legs, with tendency to gangrene; in cachectic, scrawny females with rough skin; skin shriveled, numb; mottled dusky-blue tinge; blue color of skin; dry gangrene, developing slowly; varicose ulcers; boils, small, painful with green contents; skin feels too cold to touch yet covering is not tolerated. Great aversion to heat;formication under skin. Anthracinum– Gangrene; cellular tissues swollen and oedematous; gangrenous parotitis; septicemia; ulceration, and sloughing and intolerable burning. Cantharis – Tendency to gangrene; vesicular eruptions; burns, scalds, with burning and itching; erysipelas, vesicular type, with marked restlessness. Mercurius– Gangrene of the lips, cheeks and gums; inflammation and swelling of the glands of neck; pains aggravated by hot or cold applications. Sulphuric acid– Traumatic gangrene; haemorrhages from wounds; dark pustules; blue spots like suggillations; bedsores. Phosphoric acid– Medicine for senile gangrene. Gunpowder, calendula are also best medicines. I know, there are many people who will not be able to find this funny, particularly patients who suffer from gangrene and are offered homeopathy as a cure. This could easily kill the person – not just kill, but kill very painfully. Gangrene is the death of tissue in part of the body, says the naïve little caption. What it does not say is that it is in all likelihood also the death of the patient who is treated purely with homeopathy. And what about the notion that homeopathy stimulates the body’s ability to heal through its immune mechanisms? Or the assumption that it might establish circulation to the gangrenous part? 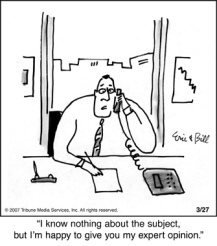 Or the claim that through case reports one can show the effectiveness of an intervention? Or the notion that any of the 13 homeopathic remedies have a place in the treatment of gangrene? ALL OF THIS IS TOTALLY BONKERS! Not only that, it is highly dangerous! Since many years, I am trying my best to warn people of charlatans who promise bogus cures. Sadly it does not seem to stop the charlatans. This makes me feel rather helpless at times. And it is in those moments that I decide to look at from a different angle. That’s when I try to see the funny side of quacks who defy everything we know about healthcare and just keep on lying to themselves and their victims. I came across an embarrassingly poor and uncritical article that essentially seemed to promote a London-based clinic specialised in giving vitamins intravenously. Its website shows the full range of options on offer and it even lists the eye-watering prices they command. Reading this information, my amazement became considerable and I decided to share some of it with you. Stemcellation injections or placenta lucchini (sheep placenta) treatments are delivered intravenously (via IV), although intramuscular (IM) administration is also possible. Stem cells are reported to possess regenerative biological properties. We offer two types of Stemcellation injections: a non-vegetarian option and a vegetarian-friendly option. Please enquire for further details. Alongside placenta lucchini, Stemcellation injections at Vitamin Injections London contain a range of other potent active ingredients, including: physiologically active carbohydrate, nucleic acid, epithelial growth factor, amino acids, hydrolysed collagen, concentrated bioprotein and stem cells. Please visit our Vitamin 101 section to learn more about the ingredients in Stemcellation sheep placenta injections. Can be undertaken alongside other IV/IM injections. Vitamin Injections London is headed by skilled IV/IM Medical Aesthetician and Skin Specialist Bianca Estelle. Our skilled IV/IM practitioners will conduct a full review of your medical history and advise you regarding your suitability for Stemcellation injections. Is there any evidence at all that any of the intravenous injections/infusions offered at this clinic are effective for any condition other than acute vitamin deficiencies (which are, of course, extremely rare these days)? Would the staff be adequately trained to diagnose such cases? How do they justify the price tags for their treatments? What is a ‘medical aesthetician’ and a ‘skin specialist’? Is it at all legal for ‘medical aestheticians’ and ‘skin specialists’ (apparently without medical qualifications) to give intravenous injections and infusions? How many customers have suffered severe allergic reactions after placenta lucchini (or other) treatments? Is the clinic equipped and its staff adequately trained to deal with medical emergencies? These are not rhetorical questions; I genuinely do not know the answers. Therefore, I would be obliged, if you could answer them for me, in case you know them.